The time of big-picture arrangements has come! Slab tiles enter our interiors with a bang. They provide a perfect complement to every arrangement and their effect of a uniform surface creates the beautiful background for furniture and decorative pieces. Following current trends and setting design directions, we are very pleased to present ULTIME – a new brand in the Cerrad portfolio. 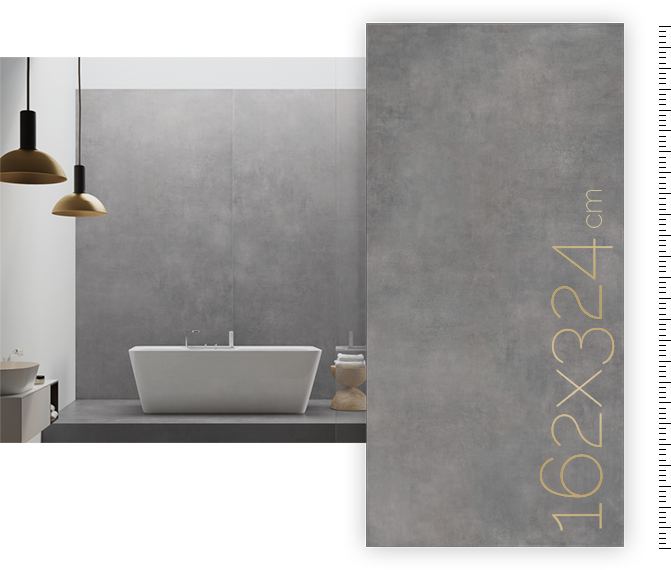 The large format collections, 160 x 320 cm, draw attention and introduce a tinge of elegance and urban chic. The Concrete, Marquina and Statuario collections combine the beauty of raw concrete and classy marble, creating beautiful solutions for those who value the freedom of design, not limited by the size of a tile. The Statuario collection is our answer to the latest trends in space design. The perfectly smooth, almost white surface featuring an unique, dynamic pattern will work perfectly both as elegant flooring and an interesting wall decoration. Inside the sophisticated interiors of a big-city apartment, they will be a great match for curiously-shaped gilded furniture and decorational additions. Such a combination will create luxurious-looking interiors that will never grow old and become even more noble with the passing of time. The Concrete collection is synonymous with modernity and elegance, and will successfully create a minimalist “total look” interior and a futuristic arrangement with a strong, colourful background accent. Marble, once associated with classic interiors, is now conquering the hearts of lovers of modern, even avant-guarde solutions. The uncanny, slightly cold material structure, together with the deep black, creates a great pair with warm, natural wood. The perfectly smooth and shiny surface of Marquina tiles makes it a great option for kitchen areas, giving both the floors and walls a dynamic, refined character.